This morning I participated in a Twitter chat (#satchat – every Saturday at 7:30 AM). The topic was “Innovation in the Classroom.” It is a great topic, and it was a great conversation. I am thankful to be able to learn from so many other inspiring educators. If you have never tried a Twitter chat, I encourage you to try it. 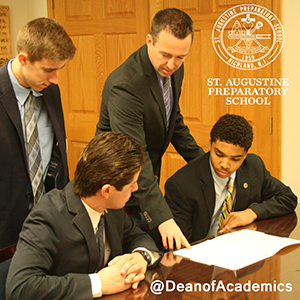 If you need help on how to, just ask me (@DeanofAcademics or Mr.Burke@hermits.com). I would be happy to help get you started. His comment has stayed with me, and I think of it often. I use it as a guide when making administrative decisions. I am mindful of it when interviewing potential teachers. And lately, with so much focus on innovation in the classroom (and an endless number of hashtags), I find his advice more powerful than ever. Innovation should be for the students first. Innovation begins with strong relationships between students and teachers, then branches out into engaging students in inventive ways. Due to social media and the internet, there are an endless number of innovative ideas available to teachers, but we need to be careful. We need to be tactful and mindful of how we implement and utilize innovative ideas. Too often, the pendulum swings precipitously in one direction. We eagerly jump on board, only to realize too far down the road that what we embraced is not sustainable. Pendulum swings should be measured before they are executed fully. An example of this is the Flipped Classroom. This is a great idea and an effective technique when used proportionally. The teachers I know who have attempted this approach, realize very quickly that a fully flipped classroom is not sustainable. I am sure some teachers have done it successfully, but my point is that each teacher must find what works well for each class and each student. You do NOT need to implement a great idea fully for it to help your students – the pendulum does not need to swing too far in one direction. Innovation in moderation can be more effective than a all-out commitment to one technique. Trying pieces of a great idea works well too. Think of your students first. Focus on them before the need to revolutionize your classroom. I recently had a great exchange with our Science Department Chair at the end of this school year. She is a wonderful and experienced teacher. She has been in education for over 30 years and has seen many pendulum swings. We were talking about her year and what went well. We laughed. She wants to do what is best for her students, and she does it each day. We should all be innovative with new, or old-school, ideas. Your innovation of choice may be a Flipped Classroom, a Makerspace, or an overhead projector, but love your students first. Love them enough to be careful that the pendulum isn’t swinging too far.